These sliders were part of the spread from the baby shower I threw earlier this month. 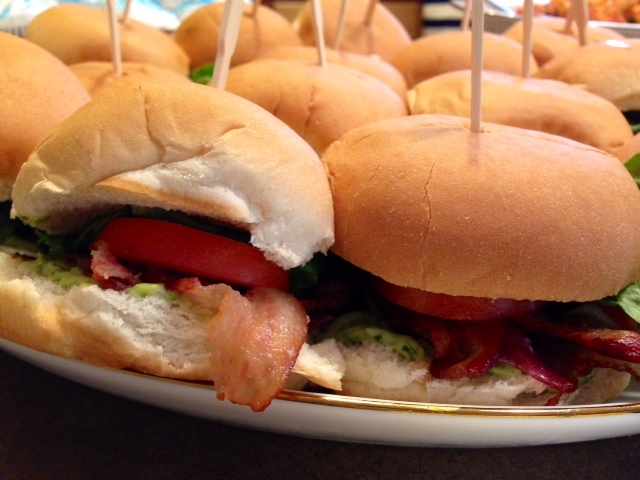 There’s no better baby shower food than a slider sandwich. Why? Here’s my logic – because they’re mini (just like babies) so therefore adorable! Not only that, but they’re a great party food because they’re easy to eat and yummy. Tomato, Mozzarella & Basil Sliders With Pesto. 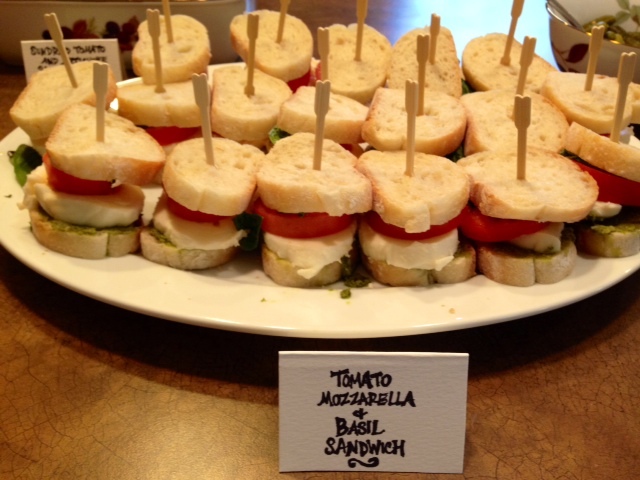 It’s always good to have a vegetarian option at a party, so I thought that it would be fun to take the basics of a Caprese salad and turn it into the sandwich using pesto as the sauce. Instead of slider buns, I used sliced French bread to create these tiny treats. You can adjust the amount you need of each ingredients based on how many you are making. 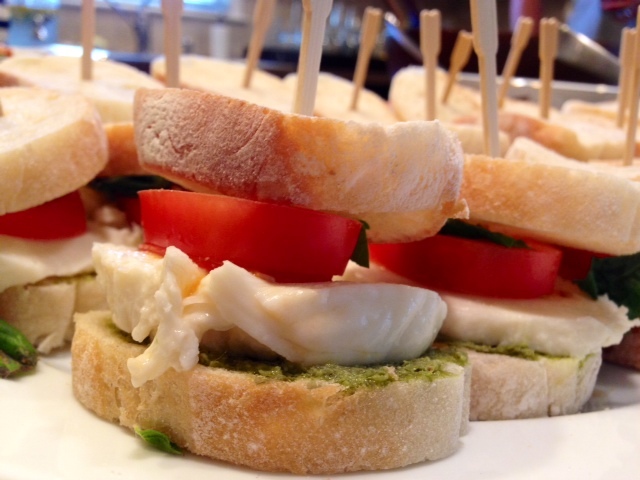 Each slider should have 1 thick slice of fresh mozzarella, 1 slice of tomato, 1 basil leaf and 1 tsp pesto. I also wanted to make a classic sandwich so I went with a BLT and added an avocado herbed mayo to jazz it up. 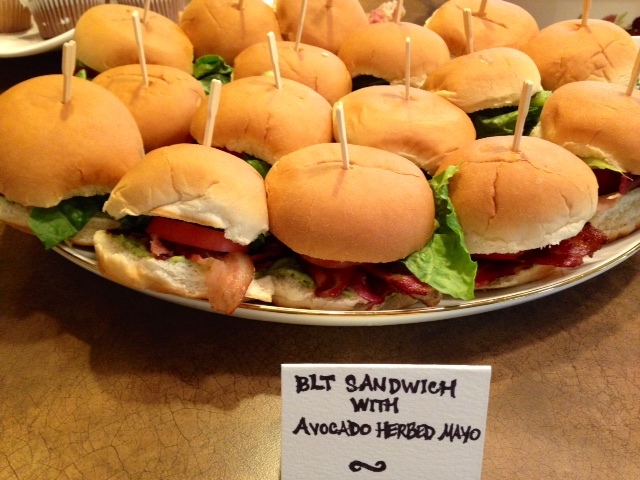 Both types of sliders were a hit, but BLT sliders were one of the most popular and went fast! Bacon makes everything better. You can adjust the amount you need of each ingredients based on how many you are making. Each slider should have about 1 piece of bacon (cut in half to fit on the bun), 1 slice of tomato, 1 piece of lettuce and 1 tbsp avocado herbed mayo. Recipe/ingredients for the Avocado Herbed Mayonnaise found here from my good friend, Chef Megan Mitchell.